A Welsh weekly has turned to a bawdy British film franchise for inspiration for its latest front page. 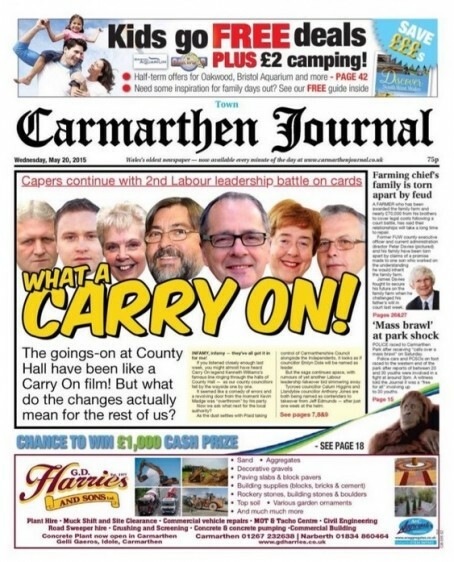 The Carmarthen Journal took influence from the Carry On comedy series for yesterday’s splash, which reported on the Labour Party group at Carmarthenshire Council choosing its new leader – who has since been rumoured to be under threat from a further coup. Former Labour leader Kevin Madge was voted out at his party’s annual general meeting last week, with Jeff Edmunds taking the helm. The authority’s Independent councillors, with whom the party had been in coalition since 2012, formed a new alliance with Plaid Cymru’s representatives two days later. As the Local World-owned Journal went to press this week there was further speculation two other councillors may be plotting to relieve Mr Edmunds of his new role – just eight days after he had taken it on. Journal editor Emma Bryant said: “A week is a long time in politics as we all know, but here in Carmarthenshire 24 hours could be more accurate. “Carmarthenshire Council has resembled a Carry On film over the past seven days with councillors in and out of roles — changes of leadership and questions over what next for the authority. “We wanted to reflect the goings on in a way our readers could connect with – and what better way than taking inspiration from the comedy classic that is Carry On. Clever idea, but pity words “Carry On” were duplicated in headlines. Ironically, I used to work for a local authority whose town hall was the hospital in Carry on Doctor. The local paper doing a similar thing would not have been more apt. Better still most of the councillors had comedy names like Cllr Fussy. Of course they won’t. They will not care a jot. Sorry Cynic, but that’s what I was taught. I was a sub for 30+ years, but maybe standards have now been allowed to slip like so many other aspects of the profession today. Punters may not notice, but that doesn’t make it right. Seen it before. Lincolnshire Echo 2003, I think, just before the local council leader was jailed. You are right Johnnerrs but that is one of the issues with the industry – for years senior management in the newsroom worried over whether to put World War One or First World War while sales declined. As newspapers, we somehow thought we were above dirty commercialism, thinking about editorial nuances when the whole shift of the industry should have been towards ensuring our papers were actually popular with the people who were stopping buying them in their hundreds of thousands.We lost our way and I am not sure we have found it. Cynic, I understand where you are coming from, but I still prefer to look back on my career with a bit of professional pride. I’m probably old fashioned and it doubtlessly resulted in my redundancy and ultimate early retirement. I am the Managing Editor of a Regional newspaper. I would like to exchange our views with you. As a matter of fact I was trained on two Brish nwspaper for a short time as a sub-editor – it is a long time. I was working on the National papers in Sri Lanka. Since then twenty years ago I launched this regional paper, The money is mine and I run it with two others only. I would like to have contacs with anyone who would like to sponsor this paper, which in he present context needs sponsorship to keep the paper floating. I had a friend of mine named Doutawaite, but I have not been able to contact him for some years. He was one time working on the ” Oxford Mail ” as a Sub. Could anyone locate him ? Please !